On an afternoon that combined old and new, Portadown eased past Carrick Rangers with a margin of victory in contrast to the pre-match importance of a fixture between two sides struggling for form. Alan Byrne helped Portadown to a first clean sheet of the season and grabbed a goal on his debut thanks to converting Niall Henderson’s corner-kick. 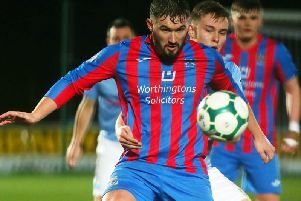 Stephen Hughes had kicked off the scoring with his first goal in Ports colours by popping up in the penalty area on 13 minutes to smash home a loose ball after Henderson’s cross towards Mikey Withers at the back post was headed down by Carrick defender Gareth McKeown, a former Ports player. It marked a return to forget for Carrick boss Kieran Harding on his first match back at a club he held the post of assistant manager with for over a decade. “It’s a great starting point for us after those three league defeats in a row,” said Portadown manager Pat McGibbon. “We stressed to the players before kick-off how it is about the sum of the parts, not individuals, so I was delighted with our team shape overall and how that helped make everything work. “We were able to get our shape right when out of possession and that helped keep the pressure on Carrick, then get our players higher up the pitch in attack. “Bar a few players, it is basically a whole new group this season and every game is helping develop that understanding. Portadown managed to increase the margin of victory to reflect the level of control when Aaron Haire forced home Withers’ headed knockdown off a Mark Carson cross. Haire required more than 10 minutes of on-field treatment and a visit to Craigavon Area Hospital following an accidental collision with goalkeeper Ryan Morell as he scored Portadown’s third goal. The game ended on a positive note for the Ports when the superb Robert Garrett created space thanks to clever footwork and steered home the final goal. “We were second-best to everything from start to finish,” said Harding. “We never started the game, never made our challenges and the work-rate was poor. “Consistency is always going to be hard when putting together so many new players but the enormity of the game did not seem to hit home.